I am not going to waste my hard-earned education on a useless debate about the differences between stealing and corruption. Much of a muchness. To be fair, he says he was quoting someone else even though he agreed with the quote. He went on to say a ‘common thief, they say he is corrupt’. He also used ‘just’ to refer to stealing a couple of times…’clear cases of where people just stole money’. You can see a thoroughly bamboozled Cyril Stober struggling to hold his laughter. This is the long-awaited ‘clarification’ as prompted by one of the journalists. He does not disappoint – he went full ham and by the end was merely one sandwich short of a picnic. This time it appears he’s saying stealing is actually worse than corruption in our culture. As an example, if you kill someone, you can go to court and try to hide under Grievous Bodily Harm (GBH) to get a lesser sentence, if you can get away with it. But surely the reverse cannot be the case? You won’t punch someone, land in court and then try to hide under second degree murder. I think this is what he was trying to say – that people hide under corruption to get away with stealing. He didn’t use ‘just’ or ‘mere’ to qualify it this time, so we can conclude he has upgraded the crime from a year ago. 7 and if he rescued Lot, a righteous man, who was distressed by the depraved conduct of the lawless 8 (for that righteous man, living among them day after day, was tormented in his righteous soul by the lawless deeds he saw and heard)— 9 if this is so, then the Lord knows how to rescue the godly from trials and to hold the unrighteous for punishment on the day of judgment. 10 This is especially true of those who follow the corrupt desire of the flesh[a] and despise authority. That verse is referring to the things that brought God’s judgement on Sodom and Gomorrah – another version refers to men going after ‘strange flesh’. This definition of corruption makes me wonder about the sexuality of some of the people who have been found guilty of corruption in Nigeria. But let us not speculate wildly. Finally, the President is clear that we should stop calling people corrupt when they have stolen money, maybe. So next time you see a corrupt government official in the streets, you know what to do. Be that as it may, weapon is not groundnut. So let’s get serious. 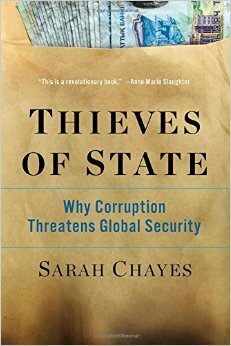 I’ve been reading Sarah Chayes’ book – Thieves of State. Nothing has ever made me think deeply about corruption as this book has. The way she uses history to trace the structure of modern-day corruption and more importantly, the effects on the lives of people who are on the receiving end of it, is very skilful indeed. You can start off by reading this piece in the New Yorker magazine that interviews her and talks about some of the points she makes in the book. Corruption is no joke and regardless of how the President tries to confuse by clarification, it is something that should be as clear as possible in our minds precisely because of the lasting, and possibly, irreparable damage it can do. Please get a copy of the book as soon as you can. If you read it and don’t like it, come for a refund from me. But if you do that just to get money from me, that is corruption. When CBN Closes A Window…. Can i apply for a refund and use that to buy the book 🙂 is that corruption or stealing? I don’t think i need to read the book anymore. Your perfectly phrased penultimate paragraph explains it all. Very interesting analysis. Deep, but fun to read!